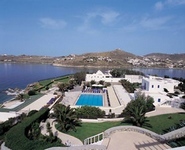 Marina Santa is found precisely three kilometres from the main active city Mykonos. The placed in the top of our 20-acre property, is found the precious stone of our elegant resort, our presidential villa. This marvellous villa deluxe 4bedroom comes complete with the most fascinating opinion Mykonos and it becomes in order to it supplies in entertained. The villa is complete with the service, the lake, the cooker, the hearth, the gymnastics, Jacuzzi and the sauna of her butlers. Begin you to spoil above in your arrival in Mykonos, with to select you above in the airport or the port with our complimentary small bus or our private service limousine then application. If your wish is for the last one in the services, we offer our private helicopter that can adapt your needs of destination in Greece. The luxury is our objective and we have the 90 rooms, sequences and villas with the private lake that they offer precisely each this for entertained. Every of the accommodations us is provided with a classic, charm of islands of beautiful colours that is praised with the panoramic sea-opinion from your balcony. All the rooms are equipped with two times the day the service of girls, the air-conditioning instrument, the mini barrier, the mini-safe, the telephone, the satellite television, the radio, bathrobes, the slippers and hairdryers. The mangers of babies and the rollaway beds are also available. We offer the luxurious sequences that have a room of meeting or in the same region with the bedroom (classic sequences) or in a separate region (sequences Deluxe). A lot of rooms have four-poster the beds, ideal for honeymooners. In order to you finish the perfect day of relaxation, you are cured in a massage, manicure or the person in the centre of beauty Clarins and the services of jamatjkw'n our sources, using only the thinner products than line CLARINS, where you will be supplied by our professionally educated personnel. Ready it goes for one night to the city, it gives in your from the sea with the visit of barber and our lounge of beauty. Shop in our exclusive Boutique or shop of gifts for their last-small-should-rich. If you prefer relative with the sports Marina Santa of activities it offers in two grounds of tennis of headlights with a tennis in favour available then application. Marina Santa understands that entertained, even if in the interruptions, they would wish they are continued with their arrangement of faculty, thus we offer a completely functional possibility of faculty in order to you we help you maintain your program of faculty. No romantic interruption is not complete without a dinner of higher category and quality. The restaurant of Daniele for us provides in you a table exceptional sea-opinion and line of dishes Mediterranean and seafood’s. Enjoy the classic and complex atmosphere of our personnel, which will supply in your all wishes. Seat behind with your beloved frozen drink, looking at outside beyond the blue sea. Enjoy a breakfast of buffets the morning or a savoury dinner the afternoon, you it will find the restaurant and our barrier of lakes perfect for each case, all the day. If the isolation is your wish, you enjoy it swims in the blue sea or the lounge of crystal in our private beach and it is revived in our barrier of beaches that offers the thinner cooker of grills. Collect together for a drink in our barrier lobby or the attitude outside in our veranda of reception for a drink of sunset. No day is not complete without certification of sunset Mykonos. Marina Santa is there for entertained us with the services to supply in each need from a professional and polite personnel. The hour 24 our that forward office will answer in all your questions and will see in all your demands, if it is for the tours and the campaigns, the enterprise and our centre of Internet, that it rents a automotive or wake-up call, this will become immediately and professionally. Enjoy the setting of sea and sky that Marina Santa provides for the all makes or your meetings. The professional personnel and our modern acoustic/optical equipment that is combined with two centres of lectures they are certain it renders any make successful. The sector of focus can also be provided from our restaurants of lakes or Daniele. Can also come in contact with the hotel of marinas Santa for the information with regard to the private service of transport with our new helicopter: Eurocopter Colibri EC120 V. We can make all the essential regulations for you, if you require this exclusive service.